﻿ Warning: Beware of Hasui "Zojoji" Restrikes! Around 2012 the copyright on Hasui works of art expired; in Japan the copyright limit is 55 years after the artist's passing. 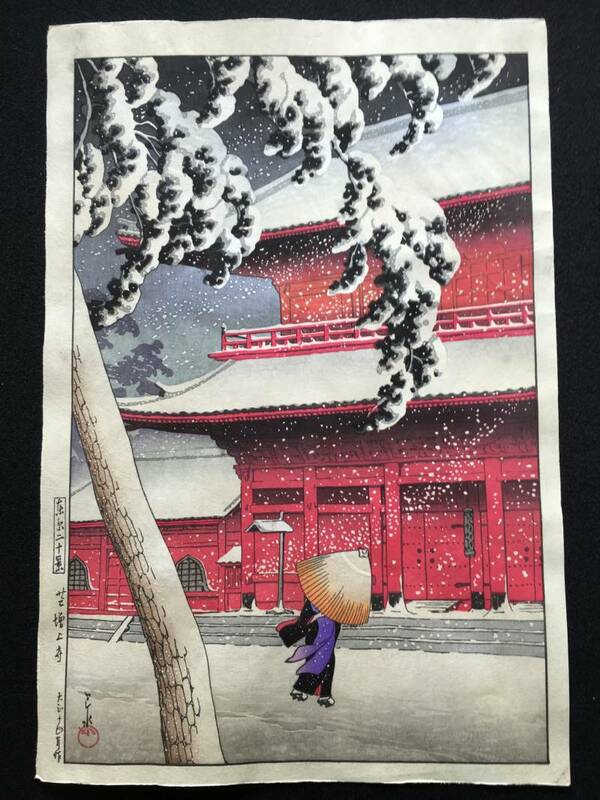 As a result, the well-known publisher Sakai Kokodo (酒井好古堂) republished Hasui's most iconic scene "Snow at Zojoji Temple". It is a well-printed and genuine woodblock print, it looks very similar to the Watanabe version, and it can be purchased in Japan for just several hundred dollars. The blocks were carved by Asaka Motoharu (朝香元晴) and printed by Hishimura Toshi (菱村敏). Please be careful that you don't accidentally pay an exorbitant price for such a recently republished print, mistakenly thinking it is an original Watanabe-published pre-war original. You can sometimes see this recently reprinted edition being auctioned via sites like eBay and an auction site here in Japan. Sakai Kokodo-published "Zojoji Temple in Snow"
How do we detect the Sakai Kokodo restrike? There is no Watanabe publisher seal on the print. 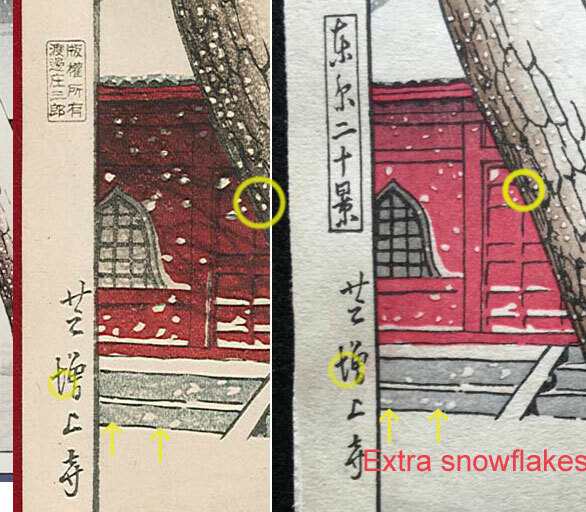 Perhaps the easiest way to determine if you have an original Watanabe-published print or the Sakai Kokodo-published print is by looking to see if your print has the extra snowflakes as marked in the image below. If your print has the extra snowflakes you have the 2012-published Sakai Kokodo restrike. Update: here is an even easier way to detect the Sakai Kokodo restrike. Bill Stein of Floating World Gallery has just pointed out that, to the best of his (undoubtedly extensive!) knowledge, all genuine Watanabe-published strikes that have the "Twelve Views of Tokyo" series cartouche in the middle of the left margin will also have a Watanabe publisher seal (usually in the right margin). Thus, prints that have the "Twelve Views of Tokyo" series cartouche, but do not have a Watanabe publisher seal, are with little doubt the Sakai Kokodo restrike. In some of the auctions I have seen, the auction sellers made no mention of the publisher, nor did they mention that the print is a very recent reprinting. This is despite the fact that they sold multiple copies of this restrike, suggesting that they were purchased directly from the publisher. They also made a point of stating that they do not have any further information regarding the print. If they are knowingly and deliberately withholding the dating and the Sakai Kokodo publisher information and thus preying on the ignorance of Hasui collectors (the vast majority of whom do not yet know about this much cheaper restrike), then in effect, this statement is their "get out of jail free" card. I've seen this particular edition sell for well over $2,500 recently, so there are definitely some very unfortunate collectors who are paying over 10 times the normal sale price of this scene. Caveat Emptor indeed. The Sakai Kokodo edition is a genuine woodblock print and is also well carved and printed, so it is worth having in a collection if you cannot afford a Watanabe early edition. The purpose of this note is simply to make unsuspecting collectors aware of its existence, how much it sells for here in Japan, and how to distinguish it from Watanabe editions. Comparison of a genuine Watanabe strike (left) and the 2012-published Sakai Kokodo restrike (right).